The date is 1671, high season for pirates in the Caribbean. As Hannah Knight reluctantly travels with her father to Port Royal to marry her betrothed, their ship is attacked. Dread turns to horror as she realizes these are no ordinary pirates. They are vampires bent on murdering them all and drinking human blood. After her telekinetic powers fail to save them and their vessel, Hannah and her father jump ship, taking their chances with the sea. They are rescued by the dashing pirate, Kane O’Brien. Finding Hannah is not the cabin boy she resembles, but a lush, beautiful woman, tempts his appetites. Soon he finds his attraction to her both a blessing and a curse, because Kane has his own secrets. Every full moon, he turns into a vampire. Fascinated by the honorable and bold Captain, Hannah has much to hide. Dare she share her secrets with him? Or will he condemn her as a witch? As the confrontation between good and evil approaches, Kane and Hannah must devise a plan to change their destinies. Only together can they defeat the malicious vampires, thwart a misogynist fiancé and escape the demon bent on their death and destruction. A Pirate’s Curse finaled in the Romance Through The Ages Contest in the Legend category! 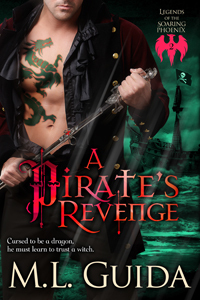 A Pirate’s Curse (formerly The Scourge of the Soaring Phoenix) recently finaled in The Hearts Through History Romance Writers in their Romance Through The Ages in the Legend, A Man for All Seasons Contest! Cursed by a demon, William O’Brien changes into a dragon with mystical powers he can’t control. In dragon form he becomes a ravenous beast with the power to destroy the crew of the Soaring Phoenix. He’s forced to make a decision: leave the ship or face killing the crew. Washed out to sea by a violent storm, Amadi wakes up on the island of St. Kitt only to be captured by slave traders and sold back to the very same plantation he’d escaped from five years before. But the plantation is under the new ownership of a vicious twisted woman and he’s trapped until the moon allows him access to his vampire powers. All Amadi has to do is keep his head down and hope no one realizes he is a previously escaped slave, and he’ll be able to leave this life far behind. But the full moon is three days away, and horrible things can happen to an enslaved man in three days. Lovely indentured Violet Perdue cannot tell a lie. If she does, her pale skin breaks out into red scratching blisters. Sold to a twisted plantation owner she is forced by her own skin to reveal Amadi to their vicious owner. Trying to make it up to him, she risks her life to rescue him from the dungeon, but how can she expect him to trust her after her betrayal? 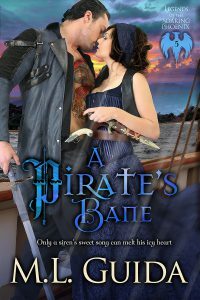 Desperate to escape she bargains to be his pirate servant if he’ll only steal her away. Tempted by her offer, Amadi agrees, but soon realizes, his little indentured servant has stolen his heart. Imprisoned. Hated. Desperate. Water Elemental Isabella is a prisoner on board the dreaded Fiery Damselpirate ship. Her choice is mate with pirate Leif Black or die. A demon wants their unborn child to complete a deadly spell. Leif is her chosen mate, and she must use all of her power to resist him for their sake and their unborn child. Leif Black has problems of his own. He has kept his sisters hidden from the crew of the Fiery Damsel and never told them that he is a vampire. Love is the last thing on his mind. But the determined demon is one step head of him and curses him. He’s now possessed by a dragon spirit, and he’s unable to control his powers, especially his lust for Isabella. Her sweet song awakens something inside him that he’d long forgotten. To keep her job as an Angel of Death, Poison must retrieve an evil board and the woman using it, but a demon beats her to it and demands she sleep with him or he will vanish with both forever. Poison has two hours to fulfill her orders received from Michael the Archangel: Locate and retrieve the dark Evil Board and capture the woman has been using it to grant wishes. She is determined to succeed and prove herself a worthy Angel of Death. She agrees to demonic temptation. Ringmaster is on a search of his own. He is pleasantly surprised to discover not only the Spell Board he has been tasked to find, but also the fledgling Angel of Death he has yearned to sample. When he learns Poison wants the same woman and board, the persuasive demon makes her a tempting offer—sleep with him and have both.